What's the first thing that comes to mind when the subject of time travel comes up? If you're like us, you probably think of flying DeLoreans or malfunctioning hot tubs; maybe even the HG Wells chair with a brobdingnagian spinning wheel on the back. Since these types of time machines (you know, the ones that actually go back in time) don't exist -- that we know of, anyway -- we need to find other methods of transporting ourselves to another time. That's where Video Time Machine comes in handy: it chronicles over a century of compiled movies, commercials, TV broadcasts, and other forms of moving pictures into one clever iOS app. We had an opportunity to get some hands-on time with both the iPhone and iPad apps and did some time travelling of our own. Did it satisfy our hunger for one hundred years of visual treats? Head past the break to find out. 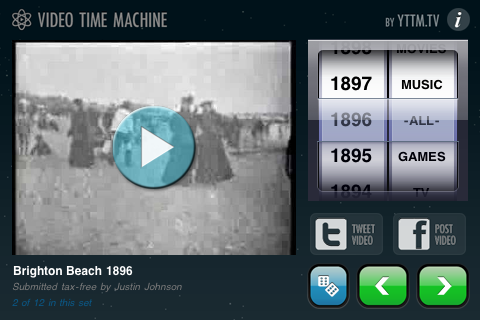 Video Time Machine for iOS (hands-on) originally appeared on Engadget on Wed, 13 Jul 2011 14:11:00 EDT. Please see our terms for use of feeds.